This Make Your Own Garlic Mashed Potato Mix has a great flavor over plain instant mashed potatoes and saves you a lot of money over those flavored convenience packages at the store. You already have all the ingredients in your pantry. By pre-making your own packets and storing them in the pantry, you will make a quick and tasty side dish for dinner and save money all at the same time. I love the ability to control the ingredients. My inspiration comes from Hilly Billy Housewife. I did double the garlic so, feel free to cut that in half if you prefer. Also feel free to control the amount of salt. 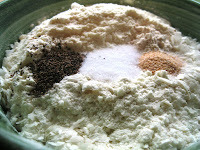 Add in some chopped chives, or even some powdered buttermilk if you desire! 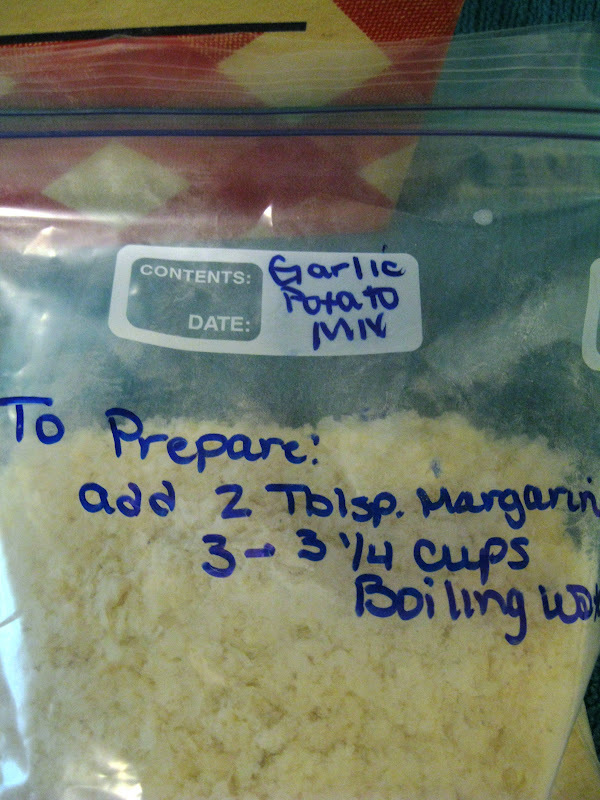 Measure all of the ingredients into a resealable plastic container. I prefer to use plastic quart sized zipper bags. 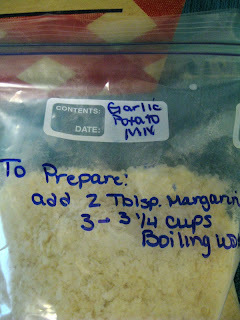 Seal and label the container, and store on the pantry shelf until needed. It's a good idea to make up several of these at a time for convenience sake. 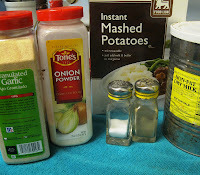 Empty the mashed potato mix into a large bowl. Add the margarine. Pour in the boiling water. Let it sit a moment to melt the margarine. Stir the mixture with a fork until it is smooth and thick. Serve hot, straight from the bowl. Makes 4 large servings. Hi, recommend the shelf life for this? I always go with the shortest shelf life of the ingredients. So check both the milk and the potato's original packaging and pick the shortest one. Hope that makes sense, and that it helps!